AuCom IMS2 soft starters are a total motor starting solution, combining high-level functionality with flexibility and ease of use. Whether you need a simple solution to starting or stopping your motor, or a comprehensive protection system for your motor and installation, the AuCom IMS2 can be configured to suit. The AuCom IMS2 offers a choice of soft start and soft stop profiles to ensure optimum control for all load types. The unique torque control system gives more linear acceleration than standard constant current, and a special pump control function reduces water hammer. The AuCom IMS2 also incorporates advanced motor and load protection features, ensuring safer operation for your application. With extensive input/output and integration options, the AuCom IMS2 minimises installation time and costs and ensures that motors can be operated with confidence. In simple installations, set up is very quick as only one parameter needs to be set before the starter is ready to use. For advanced applications, an extensive range of functions allows you to use the AuCom IMS2 to suit nearly all motor starting and control requirements. 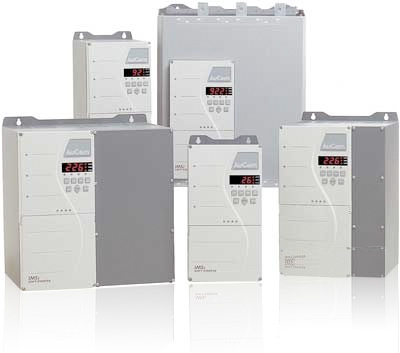 AuCom IMS2 soft starters can be connected in in-line or inside delta configuration. Inside delta connection allows control of motors 50% larger than the standard rating, and also allows replacement of star/delta starters without changing existing motor wiring. Power connections on 302 ~ 1574 A models can be configured for any combination of top or bottom input and output, making the AuCom IMS2 ideal for integration into existing installations.